On January 23 the president of the National Assembly of Venezuela, Juan Guaido, invoked articles 233, 333 and 350 of the Constitution and proclaimed himself interim president of the country. Then he began leading a strategy to end Nicolas Maduro’s government, calling the president an “usurper”. This new plan from Venezuelan opposition has gathered strong allies and seized attention of global media, but still lacks of convincing results. First part of the strategy is a struggle for international support. Guaido has achieved important recognition as interim president from at least 50 states. However this is far from the majority among the 193 member states of UN. Bigwigs at UN Security Council like Russia and China still don’t support him. Even with the main western powers on his side, the young Venezuelan opposition leader has a long way to go before isolating and delegitimizing Maduro internationally. Regardless of the international success of Guaido or Maduro, there is the basic problem of legitimacy and power within their own country. Besides the legislative power that Guaido leads, none of the remaining four State branches recognize him as interim president: neither the executive, nor the judicial, the electoral and the citizen powers. Neither do the armed forces. Second part of the strategy headed by Guaido was sending humanitarian aid to Venezuelans across the terrestrial borders with Colombia and Brazil, and through the maritime borders with Puerto Rico and Curacao. The entry of over 600 tons of aid provided mainly by the US and Chile was scheduled for February 23. It was repeatedly announced that this aid would enter Venezuela by any means, despite the refusal of Maduro’s government. On February 22, Venezuelan opposition deputies gave a press conference in the border city of Cucuta, Colombia, in which they announced how a “humanitarian avalanche” would cross the border to enter the aid. Deputies Gaby Arellano and Jose Manuel Olivares assured that it would be a peaceful protest, demonstrators would dress in white while supporting the entrance of trucks that carried the aid. They seemed confident that the Bolivarian National Guard (GNB), facing this type of unarmed revolution, would step aside and open a corridor. They also said that in each border bridge in Cucuta there would be an opposition deputy coordinating the historic operation to open the doors of Venezuela. Hundreds of journalists were ready to cover this peaceful humanitarian advance on February 23, but the situation on the ground was quite different. Instead of unarmed people dressed in white and led by the opposition figures, groups of youths with covered faces were seen throwing rocks and molotov cocktails at the GNB, which responded with tear gas and rubber bullets. It was immediately clear that the border would not be opened as planned. Which country would allow the entrance of humanitarian aid under these circumstances, with groups of civilians attacking without control? Although Guaido and his allies insist that the GNB repressed peaceful demonstrators, and many media reproduce this speech, after being on the ground it is possible to say that the GNB responded with non-lethal weapons to an aggression against their territory, as any armed forces of any country in the world would do. These youth groups led a pitched battle that lasted over seven hours on Simon Bolivar and Francisco de Paula Santander border bridges. Meanwhile the Colombian Police, in charge of safeguarding order and coexistence, simply observed the events and never intervened to prevent the humanitarian avalanche from turning into chaos and violence. Why would Colombian authorities allow young people, many of them underage, to risk their lives and attack a neighboring country? Why they remained so passive while protesters were injured and tear gas was raining in their own territory? 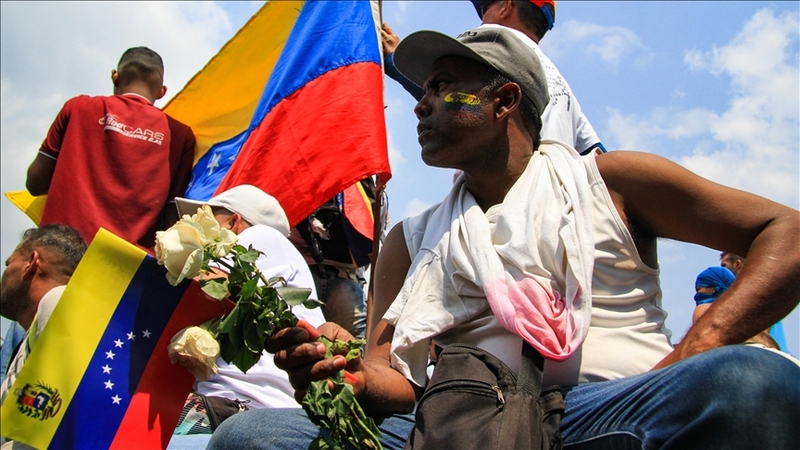 Other issue is the presence of Venezuelan civilian armed groups, the so-called collectives. Their existence in Venezuela is undeniable and it is well known that they have committed homicides, received weapons from Chavez government and stand to defend the Bolivarian revolution. During the demonstrations on February 23, the presence of these armed groups on the Venezuelan side of the border was repeatedly denounced. However, no deaths were reported. At the end of the day, no humanitarian aid entered Venezuela, instead there were at least 285 injured. In Francisco de Paula Santander bridge, two trucks carrying aid were burned and there is still no certainty of who was responsible. In the following days, the scenes of youngsters throwing rocks and molotov cocktails have become constant at the main bridges, as contemplative attitude of Colombian authorities remains. Other questions arise analyzing the role of opposition leaders. Although they assured that they would be coordinating the entry of humanitarian aid, only some of them barely appeared in the middle of the battle. On one hand, they were unable to control the civilians pouring through the bridges to confront with violence the Venezuelan guards. On the other side, some organizers wearing blue vests were seen encouraging these demonstrators, providing them masks or material to attack on the border line. Wasn’t it supposed to be a peaceful protest? Meanwhile Guaido, after giving a press conference at noon, jumped on one of the 14 lorries displayed at the border to be photographed by the many journalists following him all around Cucuta. Then he got off and disappeared until the press conference he addressed at night. He was never seen leading the humanitarian avalanche or preventing it from becoming a violent act. So there was no clear leadership from the main opposition figures who orchestrated the operation. It is impossible not to wonder how Guaido, trying to show himself as interim president of Venezuela, allowed a group of civilians to attack his own army and his own territory. Having such an amount of Colombian and international media around him, shouldn’t he have presented himself peacefully in front of his soldiers and ordered them to allow the entrance of aid to his country? This was the photo many people expected to see. One of the main debates on this episode is if the tons of aid packages that were to be sent to Venezuela qualify as humanitarian aid. Seen from International Humanitarian Law, this aid should comply with principles of independence, neutrality and impartiality. It should have an exclusive humanitarian objective and a prior study of the specific needs and how they will be satisfied. This was not the case. Even the International Committee of the Red Cross and UN refused to participate in the operation of February 23 and pointed out that it could not be described as “humanitarian”, due to its highly politicized content. On the ground, the operation was far from a genuine humanitarian gesture aimed to help the most vulnerable people, but a performance in front of global media aimed to shame and delegitimize Maduro. At the end of the day, Guaido sang victory not because humanitarian aid had reached its goal, but because the world had witnessed the repressive character of Maduro. What was the real purpose of this “humanitarian” aid then? If the purpose was to help millions of Venezuelans who suffer from hunger due to shortages and hyperinflation, or the sick people lacking medicines, a humanitarian operation could have been done in other ways and without violent confrontations. In fact, although Maduro refuses to recognize a humanitarian crises in his country and doesn’t want to open humanitarian corridors, many organizations constantly send aid to Venezuela through different ways, maintaining anonymity and ensuring that specific products reach those who need them. If there is a possible triumph in this round against Maduro, it is that a number of soldiers are leaving the Venezuelan armed forces, crossing the border and requesting protection from Colombian authorities. Venezuelan opposition leaders have reiterated the call to Venezuelan soldiers to put themselves on “the right side of history”. From February 23 until 27, there were at least 570 officers that left their positions, according to Colombian migratory authorities. This figure is relevant, but desertions do not represent even 1 per cent of the military structure of the National Bolivarian Armed Forces, which have “between 95,000 and 150,000 active fighters”, according to the information available on the website of the Ministry of Defense. Individual decisions may send some messages to Maduro, but up until now they do not question the institutional position of the armed forces that remain on his side, nor have them triggered the military coup and consequent regime change that Guaido and his allies are awaiting. In addition, the vast majority of deserter soldiers are not high ranking. For the Colombian State it implies an effort to ensure their protection and maintenance within the country, while it is unlikely that they can provide relevant intelligence information in order to advance forcefully against Maduro.